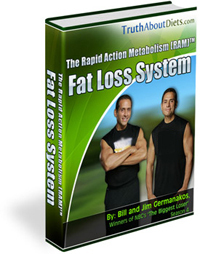 Twin brothers Bill and Jim Germanakos are the creators of Truthaboutdiets.com and the Rapid Action Metabolism Fat Loss System. Bill was one of the contestants on the television program ‘The Biggest Loser’ where he lost 164 pounds and was the winner of that season. Jim simultaneously competed in a local competition where he lost 186 pounds and was also declared the winner. In the Rapid Action Metabolism Fat Loss System they share the insights they have learned on their journey and promise dieters that total body transformation becomes easy when you have the right knowledge. Bill and Jim say that the most important thing you need to lose weight is education about proper diet and exercise. They state that one of the main things they learned was how to achieve a faster metabolism and this is the foundation of their system. The basic structure of the Truth about diets involves eating 40% protein, 40% carbohydrate and 20% fat. In addition dieters are instructed to follow some basic rules that will help to increase metabolism. These include never skipping breakfast, always eating protein at breakfast, eating frequent small meals, getting enough sleep and drinking lots of water. One day a week is recommended as a high calorie day because this helps to prevent the metabolic slowdown that is commonly associated with reduced calorie diets. They also highlight that it is important to make a lifestyle change rather than adopting a diet as a short-term approach to weight loss. Otherwise when you return to your old habits you will regain the weight you have lost. A great deal of emphasis is placed on emotional factors that may influence weight gain. They say that the most important thing that happened to them on ‘The Biggest Loser’ was discovering the emotional reasons why they were overeating. The program also includes a 4-Week Diet and Exercise Blueprint, which includes a specific strategy that will enable you to lose up to 20 pounds in one month. Certain foods are said to be metabolism boosting and these include whole grains, lean meats, fish, low fat dairy products, green tea, grapefruit, and hot peppers. Physical fitness is given a lot of attention in the Truth About Diets with both cardiovascular and strength training exercise recommended. The authors say the best way to boost metabolism is to build lean muscle and dieters are advised to engage in weight training three times a week. The book includes instructions with photographs for specific strength training exercises and the four-week program includes a full body workout chart. The Rapid Action Metabolism Fat Loss System is available in eBook format for $77. This also includes the 4-Week Diet and Exercise Blueprint, Bill and Jim’s private workout videos and an online diet and meal plan generator. Teaches awareness about the calorie content of foods. Includes a balance of protein, low glycemic carbohydrates and healthy fats. Includes a 30-day meal plan with recipes. High protein diets help to reduce appetite and maintain muscle loss when dieting. One higher calorie day per week can help improve adherence to the program. Many readers will relate to and be inspired by the author’s personal stories. Addresses the psychological factors involved in weight management. Encourages exercise and provides clear guidelines and instruction. Requires calorie counting and measuring portions. Some dieters may prefer greater flexibility in meal timing and food choices. The Rapid Action Metabolism Fat Loss System offers a fairly standard approach to weight loss that is based on calorie restriction and elimination of refined carbohydrates. The four-week plan does offer a unique twist in that carbohydrate levels are cycled on a daily basis and this may have a beneficial effect on the metabolism. Where the Truth About Diets differs from other similar programs is the emphasis on addressing emotional factors involved in overeating as well as the personal success stories of the authors that many dieters will relate to.